All eyes are turned up, staring at one of those old balconies of the railing houses that populate Barriera di Milano. Leaning on the balcony are three guys dressed in red, with bibs on which appears the writing “Fa bene.”. 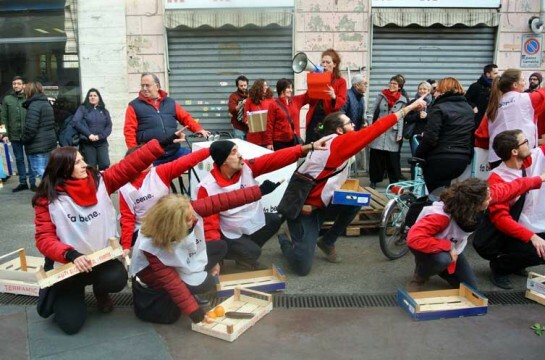 They give voice to the witnesses of some of the participants in the Fa bene Project, which collected over 110 tons of unsold food in different markets in Turin and helped 200 families to get involved in the community. How? Delivering to them fresh food products donated by market attendants or customers and asking in return to spend few hours of their time volunteering in the neighborhood. They are men and women, individuals and families who have learned a new way of creating a community. Their stories were collected through a series of interviews, which the participants of the laboratory of Social and Community Theatre™ Fa bene Barriera Live have made alive to return them to the neighborhood, giving them a body, a voice and a space. The workshop was led by Lorena la Rocca, SCT™ trainer for SCT Centre, who was able to design and realise a SCT itinerant performance that crossed Via Baltea and Corso Palermo, crept into the market Piazza Foroni, slipped into the inner courtyards and then stopped at the Public Baths of Via Agliè for a community lunch. “In the end I got up, I found a job, I resized my problems. By helping others, I also helped myself. I felt useful”… says one of the girls standing on the balcony“. That’s me”, I hear from behind. There is a girl who smiles, leaning on the cart of Fa Bene. She nods in listening to the words that are hers, but who have changed to become those of the participants in the workshop Fa bene Barriera live. She doesn’t stop smiling when she meets my gaze and gives me back a proud look.